Sphero v. Spin Master – defeated a motion for preliminary injunction in a patent infringement case against Spin Master where the Plaintiff sought to prevent the sale of a Star Wars BB-8 toy during the Christmas season. Winters v. PACCAR – overcame Plaintiff’s asserted IP claims against PACCAR and countersued to enforce PACCAR’s own IP counterclaims. The case settled in PACCAR’s favor to the tune of millions of dollars. Rehco v. Spin Master – prevailed in defeating a motion for preliminary injunction against Spin Master, followed by a summary judgment win on both patent and contract claims. Unlioc v. Electronic Arts, Ubisoft, and 5 other game developers- prevailed in an IPR proceeding by invalidating the asserted claims and then successfully defeated a motion to amend to add new claims not previously asserted before the IPR filing. Garmin v. PhatRat – prevailed in an arbitration for Garmin regarding breach of contract claims related to a patent license and obtained an award of attorneys’ fees. ADC v. Sony – prevailed in five patent office proceedings and invalidated nearly all patent claims for Sony, which resulted in a nominal settlement. Icon v. Garmin- prevailed in defeating plaintiff’s allegations of patent infringement against Garmin through motions to dismiss based on 101. Elkin v. Cerner- obtained a directed verdict for Cerner in connection with Elkin’s various claims of copyright infringement. Megan’s litigation philosophy focuses on developing strategies to terminate cases quickly while, at the same time, preparing each case for trial from the outset should that need arise. The client’s business objectives are always at the forefront of Megan’s practice, leading to an emphasis on case management efficiency and client service. Megan’s clients are in multiple technology areas, including toys, GPS technology, consumer electronics, digital rights management, video games and systems, e-commerce, and multiple aspects of data network technology and testing. Speaker, Navigating Discovery in Patent Litigation, Association of Intellectual Property Firms Annual Conference 2018, Chicago, Illinois, September 2018. Speaker, Depositions: Soup to Nuts, Kansas Women Attorney’s Association 2018 Annual Conference, Lindsborg, Kansas, July 2018. Speaker, Functional Claiming, Webinar, January 2018. Speaker, IP Provisions for Business Contracts that Every Non-IP Attorney Should Know, Two-Part Webinar Series, January 2015. 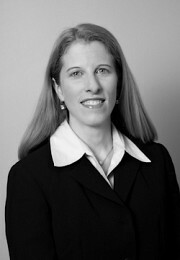 Megan served as co-coordinator for the Ivanhoe Neighborhood Council Pro-Bono Project, which received the Missouri Bar Pro Bono Award in September 2007. Megan served as chair of Cycling for Change, a Catholic Charities sponsored bike ride. Megan routinely volunteers at Operation Breakthrough. Completed a thesis in the area of eye research, titled Matrix Metalloproteinases in a Porcine Capsular Bag System.